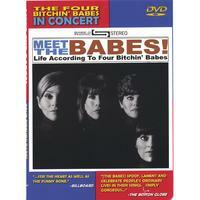 Recorded live at the Southern Theater in Columbus, Ohio, Meet The Babes captures our favorite divas at their best. Meet The Babes includes lots of Babe hits plus all the on-stage antics that make each Babes concert a one-of-a-kind theatrical experience. That's right, Video Babes! Whether you're a Babehead who would love to relive your favorite concert, or a fan who has never seen the Babes live show, The Four Bitchin' Babes' new video/DVD is for you. Recorded live at the Southern Theater in Columbus, Ohio, Meet The Babes captures our favorite divas at their best. Meet The Babes includes lots of Babe hits plus all the on-stage antics that make each Babes concert a one-of-a-kind theatrical experience. The babes are more than excellent. I was able to buy this video at a concert they put on nearby and have watched it ten or eleven times, already. The songs are great, some make you laugh, others just make you feel good, and you'll laugh in between. I would recommend this video to everyone. This is the BEST song! I loved the album but they played it on the radio and I loved it! A friend introduced her DVD to me. Loved it! Would like to have the words to the songs, however; because the sound was not too clear. Would love to see them in concert and plan to when they are in the vacinity. They are vey talented. Although the sound quality isn't the greatest (not the fault of the DVD, but of the recording process) the ladies, their songs, their harmony and their down-to-earth humor shine throughout the entire concert. Not a bad song on the list. It's a wonderful experience. I would love to see them in concert (even if the lineup has since changed). Great musicians who know how to put on a show. Excellent combination of humor and beauty... for both the babes and their music.